Somen may be the least known of the three types of noodles featured in this article, but it is no less steeped in rich Japanese culture and history. Made of wheat and characterised by its fine, thinner-than-angel-hair-pasta strands, somen was introduced during the Kamakura Period (1185 – 1333) and served only on special occasions for the wealthy. During the Muromachi Period (1336 – 1573), Buddhist temples started serving somen as a light meal. Over time, these thin, white noodles became more accessible to the masses, especially in western and southern Japan where wheat was grown. To maintain their smooth and silky strands, the noodles are lightly coated with oil. Somen, considered a summertime favourite, is best served chilled. 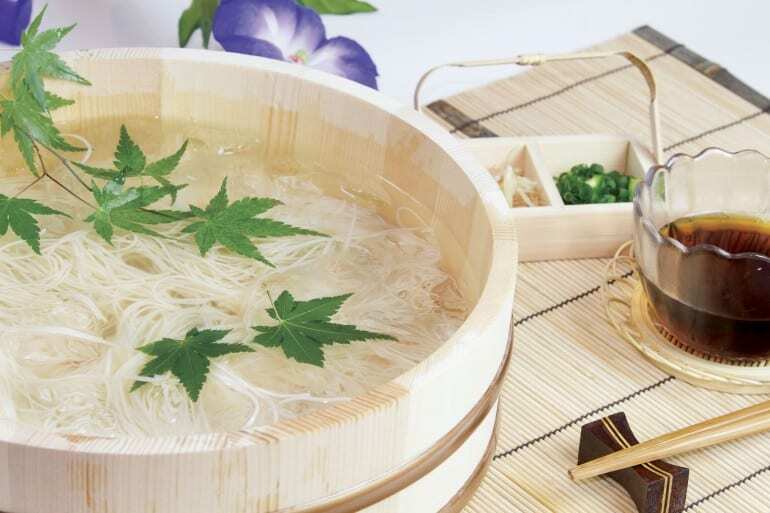 Usually served in a bowl of cold water with ice cubes and alongside a dipping sauce, chilled somen makes for a light and wonderfully refreshing meal during the scorching summer days in Japan. In Okinawa, however, somen is typically served warm; one popular somen dish is somen champuru, which refers to stir-fried somen with tofu and vegetables. One remarkably fun way to enjoy somen is called nagashi somen, which translates to “flowing noodles”. This family-bonding activity involves sliding somen down a stream of icy cold water in a long bamboo flume, during which diners use their chopsticks to pick up the floating strands and enjoy their “catch”.